How Can I Complete Tennis Offers? During the Tennis majors, many bookmakers will run Refund Offers which are profitable so long as you can find close odds so you incur low qualifying losses on your bets. I would recommend reading the Tennis Retirement Rules guide first to ensure you have an understanding of the difference and impact of these rules. You can find out all the current Tennis Offers available in the OddsMonkey Latest Offers thread. They will have a dedicated thread listing all the offers, plus individual threads for each offer too! For bookmakers that apply the '1 Set Completed' rule i.e. 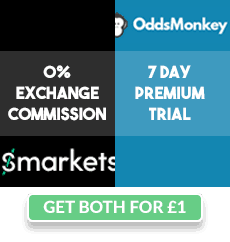 the same as the exchange, you can use the OddsMonkey Tennis Matcher to find the closest pre-match odds between the bookmaker and the exchange. Note the Tennis Matcher does include bookmaker offers for those using 'Match Completed' too. I would suggest using the Dutching tool below instead, though if you do use the Tennis Matcher then just accept there is a risk of a loss if a player retires as explained in the Retirement Rules guide. 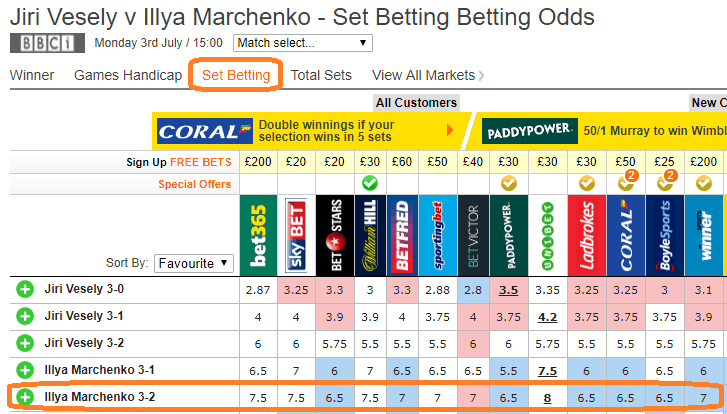 Let's take the second match of Illya Marchenko to win at odds of 2.62 and lay odds 2.76. This has a rating of 93.70%, being £3.15 / £50. 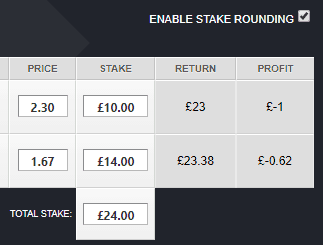 The £50 is because the Tennis Matcher assumes you are placing a £50 back bet. However, with Coral's double winnings promotion up to £50, as the odds of Marchenko is 2.62, you would only need to place a £31 bet in order to win £50 cash (which Coral would double with an extra £50 free bet). This means your actual qualifying loss is £1.95 being 93.70% x £31. Your expected free bet winnings is therefore 12.5% x £50 free bet = £6.25 free bet. Assuming you convert at least 70% of the free bet to cash then completing this offer is worth £4.38 expected cash. This gives you an £2.43 expected net profit from this one Coral offer! In summary, every time you complete this offer you will lose £1.95, however 1 in 8 times (12.5%) you will win a £50 free bet! On average this is worth £2.43 cash profit for you. Click here to watch the OddsMonkey training video on the using the Tennis Matcher for Coral Double Winnings Offer. For bookmakers that apply the 'Match Completed' rule you can use the OddsMonkey Tennis Matcher but you must accept that sometimes the player will retire, causing a potentially significant loss. Instead, I would recommend you use the Dutching tool. You can read more about Dutching and how to use the Dutching tool in the Dutching guide. To use the Dutching tool for tennis offers, simply select the bookmakers that you will be completing offers on that use the 'Match Completed' rule. 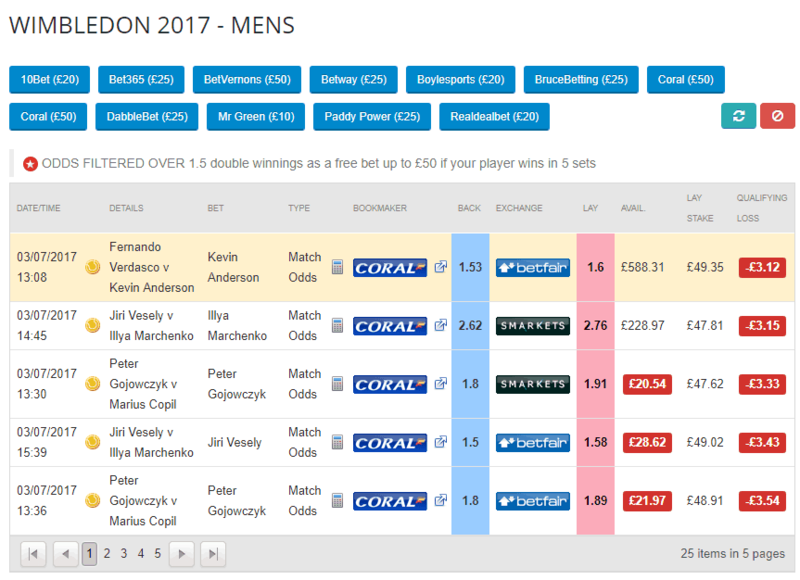 For Wimbledon 2017, by looking at the Tennis Matcher you can see there are offers on the bookmakers 10Bet, Bet365, BetVernons, Betway and BoyleSports that use 'Match Completed', so you can include these in the Dutching Filter. William Hill also use 'Match Completed' and often have excellent odds so I will include these 6 bookmakers in the Dutching filter as well as filtering for Tennis and for the relevant date range (some bookmakers may say you can only qualify for bets placed on the same day). Note you should save this filter as 'Wimbledon 2017 Match Complete' (or similar) for easy use every day! Taking the first result in the Dutching tool, you can bet on Siniakova on Bet365 with odds of 1.5 and Sakkari with odds of 2.87. This has a rating of 98.51% and by placing these two bets you will qualify for both offers! Bet365's offer is 'pay out if your tennis player goes 2-0 up' and Betway's is 'Double Winnings if your player loses the first set and goes on to win'. By default the total is set to £100 (or very close to). If you are completing an offer with a max stake of say £25, then you can simply enter £25 in the stake box for that bookmaker and it will automatically amend the stake on the other bookmaker! So in the above, if you bet £67 on Siniakova on Bet365 and £35 on Sakkari on Betway, you would qualify for both offers at a qualifying loss of only £1.55. Note it is best to check the offer maximum stake / winnings and determine you stake size accordingly. Due to the very fast moving odds in-play with tennis matches, you cannot use the Tennis Matcher or Dutching tool. Instead you need to manually flick between two tabs, either the bookmaker and the exchange (if the bookmaker uses '1 Set Completed') or two bookmakers that both use 'Match Completed'. For '1 Set Completed' bookmakers you can check the exchange lay odds and lay using normal in the Calculator. For 'Match Completed', William Hill always has good odds and uses the Match Completed rule as well, so they would be a good option to use alongside the bookmaker with the in-play offer. Let's say you want to back Adrian Mannarino for BetBrights '25% casback on in-play losses' from BetBright (uses 'Match Completed') and back the opponent on William Hill. Then, using the Dutch Search tool from Oddsmonkey, you can calculate your stakes for both bookies. Open the Dutch Search tool and click on any “i” icon for a sports event that have only 2 outcomes. This would give you a qualifying loss of either 62p or £1 depending on who wins as shown in the 'profit column' so you would then decide if this is worth it based on the BetBright offer!